Bed of Roses Block 4 – Part 2 and Some More Baltimore Pics! This past weekend I finally put the binding and hanging sleeve on my “Friends of Baltimore”. I am reluctant to actually finish this quilt. Not sure why. I think it marks the end of a journey that I just don’t want to end, but I have loved sharing the journey on my blog! First, I made sure the corners were square. Then I trimmed the batting and backing. I always find this step most nerve-wracking. It just seems so much could go wrong at this point! I carefully machine stitched the binding to the quilt, making sure that the seam was exactly where it was supposed to be so that the triangles on the sawtooth border were perfect triangles and had all 3 points! Next, I made a pot of tea (or two) and hand-stitched the binding in place. Thank goodness for audible books! And as usual, I had lots of company! Here are a few more blocks showing the amazing machine quilting that Ruth Quinn from Stitching Impressions did. If you check out her blog, you will see that Ruth describes in detail how she came up with the designs for each of the blocks. Very informative! Ruth is displaying my quilt in her booth at the Simcoe County Rug and Craft Fair this coming weekend. Hope to see you there! 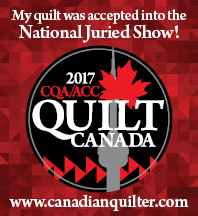 It is always a great show, with not only quilts, but hooked rugs, spinning and the most amazing sugar pie you have ever tasted. If you are stitching Bed of Roses along with me, you will receive Block 4 this week. This package will include the first border, so here are a few helpful hints. Cut 15 assorted pink rectangles according to the directions. Stitch these rectangles together, but only stitch half way up the seam (about 2 “). Press these seams open. Place the bottom edge of this strip along the edge of the border and stitch in place. Next, make a template of the curve provided in the pattern. I used plastic template material. Trace the curve on each of the rectangles. I am not going to lie, when I first read the directions, I was a little leary of this process, but it is pretty slick. I’m impressed!! So is Bruin. Very Impressed. Before I forget, the white border is cut extra long, so don’t be concerned that the pink strip is shorter than the border. Okay, so now just trim 1/4″ away from the and start to stitch! Ruth did an awesome job of quilting, but look at the palette you gave her! I’m totally in awe of your applique prowess. I hope you enter it in MQX East; it’s definitely a contender. Did Ruth stitch on the applique to give it so much definition? Kerry, your quilter did such a good job on FOB. It is out if this world beautiful. Kerry, what a masterpiece! Congratulations! I have enjoyed watching you put this together. Question — you say you were careful to get your binding seam just right for your sawtooth border, but HOW did you do that? The binding is on top and the triangles are hidden in the middle where you can’t see them while you’re stitching. What’s your secret? Just beautiful, the applique and then the quilting to complement it! Wow. It is interesting to study the quilting designs used in each of the blocks on the Baltimore quilt. Beautiful quilt! Kerry I was able to see your quilt up close and personal, I was at the Simcoe Craft and fair and Ruth was there I knew it right away. It is so absolutely fabulous your work is incredible and like i said the quilting was just icing on a deliciously put together cake. Wonderful wonderful work!